On May 3, 2013, at the age of 77, Bernice Bordelon scored the biggest win of her Senior Olympic career: she helped bring the Louisiana state championship games to the greater New Orleans area. 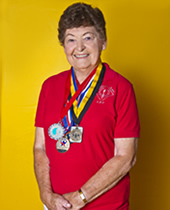 Bernice got involved with the Senior Olympics at age 55, inspired by joining an over-50 volleyball league. She went on to set two records in track and field events, then took up weightlifting. Fueled by her love for sports, Bernice became the driving force behind the Greater New Orleans Senior Olympics (GNOSO) for more than a decade, both as an organizer and the games’ most vocal champion. GNOSO membership continues to grow under Bernice’s leadership. Last year’s games drew more than 900 participants, enough growth to require a major facility upgrade. Bernice has inspired countless area residents to discover the joy of sports, spreading the word that competition encourages us to push ourselves to higher levels than we ever thought possible. Through life experience, Bernice has learned the value of competition to our very survival. After a stroke paralyzed the left side of her body in 2007, she made the tough decision to compete against her paralysis. Unwilling to accept the defeat of her body, she took up a new sport … weightlifting. It was an arduous struggle, and she was often tempted to give up. But small victories reinforced her disciplined determination, and she now enjoys an almost total recovery. Bernice Bordelon has mastered one of the most important lessons of all: how to win at life. By embracing the positive qualities of competition, she inspires all of us to raise the bar for what we can accomplish. Bernice Bordelon … Peoples Health Champion.